If you happen to walk by the new building project at 1580 Piercy Avenue in Courtenay you are likely to hear the sounds of hammers, saws, and power tools of new homes being built. That’s pretty standard. What’s not standard are the type of people you’ll see building the homes. Instead of the usual construction crew, at this site you’re likely to see teams of women sporting pink hard hats and pink t-shirts, or men and women of all ages laughing and sharing stories as they raise walls and swing hammers. These amazing people are the volunteers who have decided to devote their free time to build houses for people they might not even know. These volunteers are the backbone of an organization called Habitat for Humanity. Every 24 hours, nearly 150 new homes are built by Habitat for Humanity volunteers. In Canada, more than 63,000 volunteers work with Habitat every year. That’s a lot of swinging hammers—and it’s also a lot of love. Habitat for Humanity started in 1976, when a wealthy businessman, Mr. Millard Fuller, decided to scrap it all and devote his life to helping the poor. He started Habitat for Humanity by developing the idea of partnership housing, which called for families in need to partner with volunteers to build simple, decent, and affordable homes. Habitat for Humanity is based on a model that is elegantly simple—Habitat homes are built on donated or discounted land using donated or discounted materials and volunteer labor, all which keep the house costs low. The partner families purchase the houses with no interest loans and the monthly payment goes into a revolving fund that is used to build more houses. Habitat calls it the revolving fund for humanity. In addition, Habitat for Humanity operates ReStores in many locations to fund the administrative and fundraising costs of the organization. ReStores are run entirely by volunteers and are stocked with used or discounted home items sold at a great price. ReStores are a bargain hunter’s paradise. And since the store’s profit covers the overhead costs of the organization, any additional monetary donations go entirely toward purchasing supplies for the new homes. Sweat equity equals at least 500 hours of volunteer work that must be completed by the prospective homeowner before they can move into their new home. Those hours are important as they are the investment the family makes in their future. Partnership families literally build their own housing solution, and as such Habitat calls their work a ‘hand up’ instead of a ‘hand out.’ The North Island chapter of Habitat for Humanity started back in 2003 to address the growing need for affordable housing in the Comox Valley and Campbell River. It’s a good thing too, as Canada is in the middle of a housing crisis. The situation in the Comox Valley is getting worse every year as rental rates go up. In fact, the 2009 Comox Valley Quality of Life Report stated that rental rates in the Comox Valley went up an overall average of 7.9 per cent from 2007 to 2008, which is more than double the rate of inflation. This rental increase puts more pressure on families that are already stressed to their financial limits. 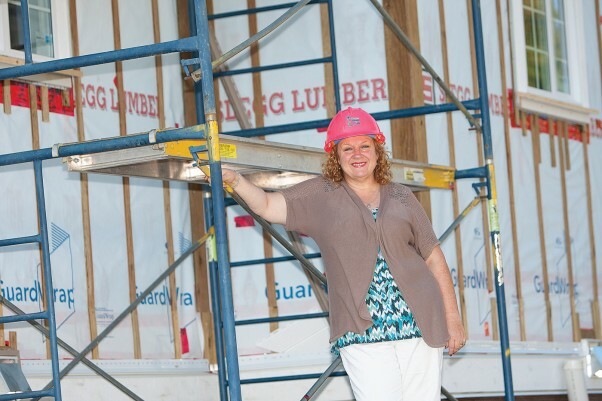 Deb Roth is the executive director of Habitat for Humanity North Island and was one of the founding board members. As such, Roth is well aware of the need here for more affordable housing. “Habitat’s Family Selection Committee interviews families who apply for a Habitat home and have an opportunity to see firsthand the challenges that face a number of families in the Comox Valley,” she says. Since 2003, the North Island chapter of Habitat for Humanity has built eight homes for low income families, and that goes a long way toward supporting a thriving community. Studies show that home ownership is pivotal toward breaking the cycle of poverty. In fact, when a family moves into their own home they become healthier both physically and mentally. Parents feel less stress, family members interact better with each other, kids do better in school, and their confidence improves. Currently, Habitat for Humanity North Island is in the midst of their biggest project yet—the aforementioned six unit development at on Piercy Avenue. Of the six units, two are completed, and for two Comox Valley families, those two front doors reflect the realization of a dream they never felt they’d achieve. Tucker first found out about Habitat for Humanity 18 months ago when she was approached by a friend who felt Tucker would be a good Habitat for Humanity candidate. Though Tucker is thankful to everyone at Habitat for Humanity she was most touched by the hard working volunteers that she saw almost every day. “This has been a life changing experience for me, but what’s impacted me the most are the countless volunteers that showed up every day to build a house for someone they didn’t even know,” Tucker says. “When I drive down the driveway on my way to work they are already there and Luca waves at them as we drive past. I tell him ‘they built this house for you’ and I promise myself that I’ll work hard to make sure he understands beyond a shadow of a doubt that these people built this home for us because they loved us so much. That’s the least I can do to say thank you for all they’ve done for us. Leina Braconnier, 54, is the mother of two daughters, aged 18 and 28. Her eldest daughter is away at college, but her youngest daughter just graduated from high school. Though Habitat is always looking for people to help on their build days, which are Wednesdays through Saturdays, if you’re not one to swing a hammer you can always volunteer at one of the ReStore locations. Because everything about Habitat for Humanity is based on helping others, the benefit that Habitat brings to a community is more than the sum of nails, wood and paint. It’s exponential. It’s life changing and community building. When community members rally together to help each other something shifts—and we’re seeing that shift here in the Comox Valley.